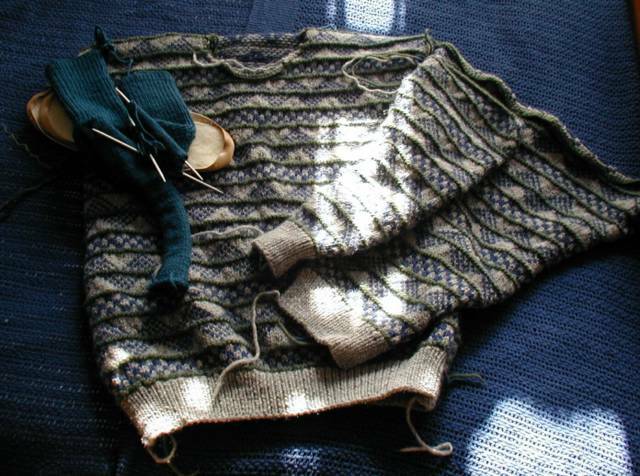 Here is a picture of a sweater that I am making for my husband (click on the photo to see a larger pic). (a) It's made of Red Heart acrylic. (b) I don't have a husband. (c) It's a bad picture. (d) I started making it in 1996. You see, what happened is this. When I started dating my soon-to-be-husband in 1995, I wanted to knit him something, but The Boyfriend Curse loomed and I certainly was not willing to commit to a sweater. So I made him some very lovely felted mittens, which he wears to this day. However, once we were engaged, I decided that a trip to the yarn store was in order. (It helped that the yarn store was having a going-out-of-business sale.) I thought I could knit him a sweater and give it to him AFTER we were married, thereby avoiding the curse, and all would be well. So I bought the yarn. And started the sweater. But it was a little fiddly. And he's almost six feet tall, so it was slow-going. And it was kind of a bulky item to carry around with me. And I kind of lost interest. And then I took a felting class and I became obsessed with making hand-felted hats. And then I took a spinning class and bought my own wheel (and stained it and assembled it) and I became obsessed with making my own yarn. And then we moved to a new state and got new jobs, and then we bought a house and moved again, and then we spent nine crazy months trying to fix up the house before the arrival of our first baby, and then I went back to work, and then the second baby arrived, and now I'm back at work again. 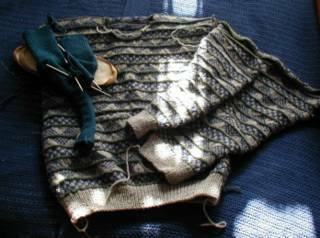 Every so often DH asks about the sweater, and I pull it out and pat it gently and I try to get enthusiastic about finishing it. Because, really, it's mostly done. The front and the back are done and they are sewn together. One sleeve is done, and I have two inches to go on the other one. And then it's just the collar and the seaming (ugh). But it's hard to get enthusiastic about it, because I'm not even sure it will fit him. (Yes, I did a gauge swatch, but, well, I was a much less experienced knitter then, and who knows what grievous mathematical errors I might have committed.) And even if it does fit him, DH rarely wears wool sweaters these days. When we lived in Vermont, and he worked in a drafty brick building that used to be a state mental hospital (that's a story for another day), his wool sweaters got a lot of use. But now we're a couple of hours south--which makes much more of a difference in climate than you might imagine--and his office is about eighty degrees all the time, so...well...it might not be all that handy. I'm just saying. But. A few months ago DH had to have a major, very invasive surgery in order to remove a tumor and many lymph nodes in his abdomen. Thankfully, the tumor was not malignant, and DH is very well now, and I am very grateful for this. Am I grateful enough to finish the damn sweater? You betcha. At least, I'll give it a shot. And if he reads this blog, he may just snicker. But at least he'll know that the intent was there. That's what counts, right? Oh--and what's that in the upper left hand corner of the photo, you ask? "Hmm, could that be some slipper socks that you started knitting for your DH years ago and that you subsequently abandoned when more exciting projects called? Can't you finish those, too?"